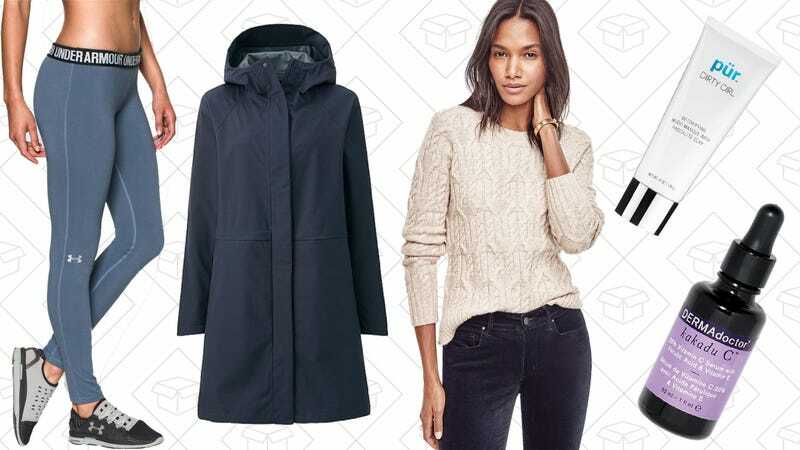 Under Armour Outlet’s End of Season sale, Uniqlo’s Flash Sale plus free shipping, $25 sweaters from Ann Taylor, and more lead Tuesday’s best lifestyle deals. When brands do limited-edition runs, it’s hard not to jump at the chance to purchase them. MAC Cosmetics is not only letting you buy limited edition and fan-favorite products for the last time before the disappear, they’re taking 40% off. How nice of them. 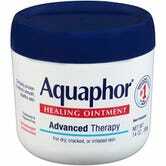 Aquaphor has been around forever and for good reason. This stuff works like magic on dry skin, especially come wintertime. I always have some around for tattoo aftercare, but also grab for it when my hands hurt from forgetting my gloves. Clip the coupon, sign up for Subscribe & Save (you can always cancel) and save 20% on this 14oz jar. Winter is a horrible, horrible time for your skin. The wind and the cold and the snow just wreak havoc. So Ulta is here to help you battle the elements with their Love Your Skin event. Grab different deals every day on top skin care brands like Peter Thomas Roth, bliss, Mario Badescu, skyn Iceland, First Aid Beauty, and more. Today’s deals include Dermadoctor Kakadu C 20% Vitamin C Serum for $50 and PÜR Dirty girl Detoxifying Mudd Mask for $15. If you’ve never tried Marc Jacobs Lip Crème, now is a great time to start. This limited edition shade called Bad Behavior is only $22, which pretty fantastic seeing as every other shade is full-price still. This Uniqlo Flash Sale is a little bit different than the ones we’re used to. Nothing is really marked down, but if you purchase any of the spring styles listed (I recommend the Block Tech Coat or the MA-1 Bomber Jacket), you’ll get free shipping on your entire order. I’m sitting here writing this with two blankets and gloves on because our office is frigid. If you’re also dreaming about the warmer weather and want a head start, Nordstrom Rack is discounting a bunch of Tommy Bahama for both men and women, including swimwear. Aloha, or something. In need of an update to your sweater drawer? Ann Taylor is marking down a bunch of really great sweaters to under $25. Cardigans, turtlenecks, boatnecks, and more (including some really great Merino wool ones too) are marked down today only. Topshop is taking up to 70% off a ridiculous amount of things, including stuff from their Unique line. My recommendation is to check out the dresses and shoes, as my experience has proven that those are the most reliable sale items. The cold weather is here, and it’s time to dress appropriately. Backcountry is taking an 30% off a ton of styles during the Year-End Sale. This includes everything you need like outerwear, layering pieces, and cold weather accessories. Need Supply, the Richmond, VA shop for everything trendy and cool, is having a pretty sweet winter sale. Get up to 70% off a ton of items and make your winter wardrobe a bit more fashion-forward. Plus, they just dropped added a bunch of new sale styles, for both men and women, so it’s really a win-win. The best part of this Rebecca Minkoff sale on Nordstrom Rack is that not only are the cult-favorite shapes like the Regan Crossbody and the Mab Saffiano Tote on sale for up to 50% off. The Bath and Body Works Semi-Annual Sale has basically any kind of home fragrances, soap, and skin care you could need, at prices that are worth the ridiculous packaging. $11 3-wick candles, $3 foaming soaps, 50% off specialty skin care, and more. Plus, use the code F165207 and get $10 and order over $40. Sorel is one of your favorite winter boot brands, and the Tofino was the one to beat. But if you were looking for something a little different from Sorel, their Winter Sale is for you. Take 25% off some fashion-forward styles that’ll make your old galoshes look like garbage bags for your feet. Restock your underwear drawer on the cheap with $3 undies from Aerie. Every style you could think of is marked down, including the adorable Sunnie line. It’s gonna be hard not to leave with 10 new pairs. Cold brew coffee might not sound appealing in the winter, but that’s only if you conflate it with iced coffee, which is not the same thing. Cold brew is just a steeping process that results in less acidity, among other benefits, and you can enjoy it hot or cold all year ‘round. 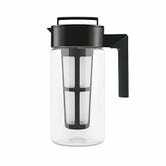 If you want to give it a shot, the Takeya Cold Brew Coffee Maker is the easiest way to get started, and it’s only $18 today. This non-coffee drinker bought one of these last year, and I’m absolutely in love with it. All you have to do is fill the basket with ground coffee, fill the container with water, and let it steep overnight in the fridge. The resulting coffee concentrate needs to be watered down, so one batch should last you several days. Amazon’s listed slightly lower prices on a few occasions, but $18 is still several dollars less than its usual going rate. This was one of our 16 most popular products of 2016, so if you still haven’t tried one out, it’s time to jump on the bandwagon. Here’s what you treated yourself to to take away the pain of 2016. Krill oil? D3? Omega 3? One-a-days? If you want vitamins, Amazon’s got vitamins, and dozens of them are deeply discounted in today’s Gold Box. 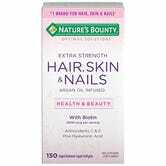 You’ll find vitamins to help you sleep, vitamins to make you poop, and even vitamins to strengthen your hair and nails. Just note that like all Gold Box deals, these prices are only available today, or until sold out. Note: Some of these even have additional coupons you can clip, so be on the lookout. If you’ve enjoyed the new Star Trek movies, and want to catch up on the show that inspired them, you can beam up the complete original series Blu-ray box set for $40, an all-time low. This should sell out quickly, so I’d head over to Amazon at warp factor 7 to grab your copy. The deal is Bond. James Bond. Currently on Amazon, Prime members can own all 24 Bond films on Blu-ray for $75, the best price we’ve ever seen. This set unfortunately doesn’t include digital copies, but at barely more than $3 per movie, it’s tough to complain. This is (I hope) going to be the most boring deal I write about today, but hey, life is kind of boring, and everyone needs to hang up pants. 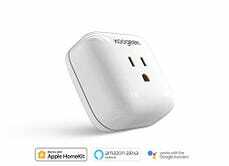 We see deals on WeMo switches and TP-Link Smart Plugs on a pretty regular basis, but this similar product from Koogeek is Apple HomeKit certified, and only $28 today. Like those other smart switches, the Koogeek Wi-Fi Smart Plug includes an app for turning your electronics on and off, and putting them on a schedule. The key difference here is that you can also control it with Siri from your phone, or from Control Center in iOS 10. That’s a big deal if you’re an iPhone owner, and with promo code PNEZ9SGY, you’re not even paying a premium for it. Who among us has the time to both vacuum and mop our hard floors on a regular basis? Enter the Hoover FloorMate Deluxe, which uses cleaning solution, powered scrub brushes, and suction to do everything at once. The best part is that the FloorMate Deluxe actually vacuums up the dirty water as you go into a separate tank, so unlike traditional mopping, you won’t just be pushing around the same dirty water around your house. Today’s $84 deal is an all-time low, but it’s only available today, so grab yours before they’re all cleaned out. Still using the $10 pots and pans you bought at Walmart freshman year of college? 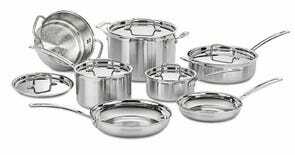 Do yourself a favor and upgrade to this complete tri-ply set from Cuisinart for just $190, an all-time low. If you aren’t familiar with tri-ply cookware, it basically sandwiches a layer of aluminum inside the outer stainless steel layers, resulting in a pan that’s durable, induction-compatible, oven safe, and still quick to heat up. It’s cold. What should you do when it’s cold? Turn the oven on and bake something. 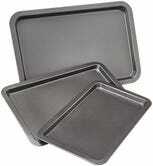 This set of three baking sheets costs less than the ingredients to make chocolate chip cookies, and means you don’t have to worry about fitting all of them on one sheet. When Sony rolled out the new PS4 Slim and PS4 Pro, they also quietly tweaked the DualShock 4 controller, and here’s another chance to get it for $40, with no sales tax for most buyers. This is basically the same gamepad you know and love, but with a futuristic looking light bar at the top of the touchpad, and the ability to communicate over USB when plugged into your console for lag-free input. 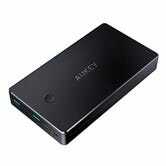 Aukey is fairly unique in offering USB battery packs that can recharge over a Lightning cable, and two different 20,000mAh options are on sale today. The more expensive of the two includes Quick Charge 2.0, which somewhat ironically isn’t available on iPhones.